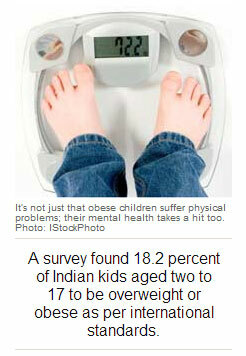 A generation of obese urban Indian children face huge medical risks and reduced life-spans. How can parents and schools fight this problem? His sluggishness and increasing appetite, his periodic breathlessness, occasional dizzy spells and pain in the knees were all dismissed as things that would disappear once he grew up. “But as his weight kept increasing, we became concerned and wanted to consult a good doctor,” says Aftab’s father, Mohammed Ramzan Solanki. Kids like Aftab are part of a fast-growing national urban epidemic seen over the past few decades. It’s an irony that despite there being more undernourished children in India than in any other country, we also have millions of obese and overweight urban schoolchildren. And experts say these obese children will one day face severe medical consequences. Compared to children of normal weight, obese ones face several times the risk for developing high blood pressure, respiratory complications, Type-2 diabetes (the most common form of the disease), cardiovascular disease and cancer—and, indeed, much reduced life-spans. CME conducted by Fayth Clinic : CME on common adolescent problem and newer modalities of treatment in hypertension was conducted by Fayth Cinic in association with Dadar Medicos Mumbai. CME was attended by 45 doctors on 19th october 2014 and was very well appreciated by the attending doctors.